Seafood makes for a delicious and healthy meal, and cooking enough for leftovers ensures you can enjoy your dish without having to make it from scratch. Eat leftovers within four days of when the meal was prepared to prevent food poisoning or other food-borne illnesses. The key when reheating seafood is to prevent it from becoming too dry while ensuring it tastes as good as it did initially. Place the leftover seafood in a casserole dish. 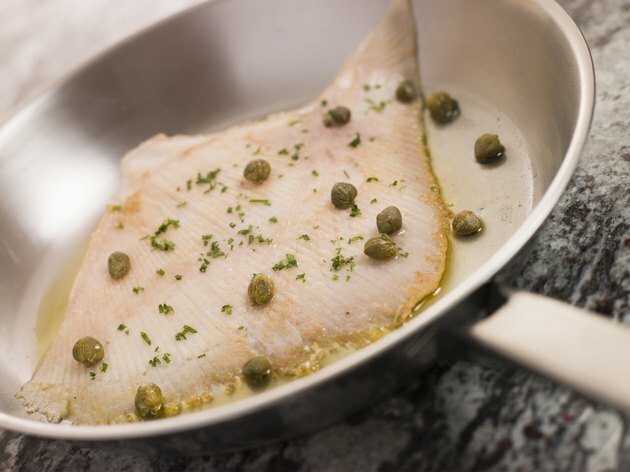 Grease the dish with butter, olive oil or non-stick cooking spray if you are reheating fish or something that typically sticks to the pan when cooking. Cook the seafood for 12 to 15 minutes, turning it once halfway through the cooking process. Cooking times may vary depending on the amount and thickness of your seafood; thicker or stuffed fish may take up to 20 or 25 minutes, whereas something thin like calamari strips may finish reheating in 10 minutes. Keep an eye on your leftovers to avoid overcooking them. Remove your leftover seafood from the oven when it is hot all the way through. The USDA recommends reheating leftovers to an internal temperature of 165 degrees. Serve immediately. Place 1 tablespoon of butter or olive oil into a skillet and warm on the stove over medium heat. Put your leftover seafood into the skillet and sauté for three to five minutes on each side. Thinner or smaller amounts of food will take less time to cook than thicker foods. Watch the leftovers cooking in the pan to avoid burning your meal. Turn the seafood over halfway through cooking. Remove the seafood from the pan when it is browned on both sides and hot all the way through. Serve while hot. Use your leftovers within 4 days, as per the USDA Food Safety Guidelines. To avoid bacterial contamination, discard any leftovers that have been unrefrigerated for more than 2 hours, or 1 hour for food in temperatures greater than 90 degrees.